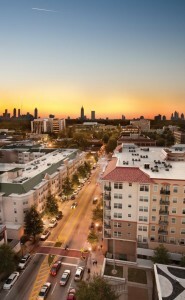 Decatur is considered one of the nicest of Atlanta’s suburbs. Its small-town feeling, abundance of excellent schools (both public and private), community events and civic participation set it apart not only from Atlanta proper, but many other cities and towns in the United States. In fact, it was named one of the best neighborhoods in America in 2013 by the American Planning Association. Decatur prides itself on its quaint small-town atmosphere. The city only spans about 4 square miles and its downtown is only a few blocks, yet packs a punch. If you are looking for a community that you want to be a part of, Decatur is the type of place. There are always events going on such as the Decatur Book Festival, Decatur Craft Beer Festival, and the Decatur Wine Festival. Best of all, these events are mostly run by Decatur citizen volunteers which helps to further connect the community. Also, the city puts extra effort into connecting with its residents with The Decatur Minute and Be Active Decatur, Decatur’s two blogs that allow residents to stay updated on everything that is happening in town. Even to remind you to change your clocks for daylights saving time and check your fire alarm batteries. Downtown Decatur is its entertainment centerpiece and has received very high reviews. The city has spent considerable effort in producing an attractive downtown which includes public art, 400 street trees, wide sidewalks, extra bike lanes which is easily accessible from Atlanta with the MARTA station located downtown. Boasting over 150 locally-owned services, retailers and restaurants, Decatur has named itself a destination for “foodies, fashionistas, and fun-lovers.” Also, if you are looking to live downtown, although it is small, there are several options for cheap apartments with all bills paid and studio apartments for rent. Decatur may be tiny, but that does not mean its residents do not love the arts. If you ever feel the need to learn ballet, make sure to check out the Decatur School of Ballet where in addition to ballet, jazz, tap, modern dance and other dance classes are offered. Also, you cannot forget about the free Decatur Arts Festival hosted in downtown every year. Or, if you would like to experience original film and theater from Atlanta directors and writers, Push Push Theater is the way to go. Education is an important part of Decatur’s community on many different levels. The Decatur City School Disctrict is considered some of the best in Georgia and in 2014, CSD’s overall K-12 was rated as 6th in the state of Georgia. Meanwhile, the Waldorf School of Atlanta is located in Winona Park (one of Decatur’s neighborhoods) and Dekalb School of the Arts (K-7th grade) is located in Avondale Estates. However, high school is not where Decatur’s education ends. With several schools such as Emory University, Agnes Scott College, and Columbia Theological Seminary, Decatur is much more than your typical suburb. Students moving to Decatur ought to use an apartment guide when looking for homes for rent in order to find a good spot near their school. Those attending Emory University will most likely be apartment finding in Druid Hills or Clairmont Heights. These neighborhoods are all located in North Decatur are comprised of many affluent residents which may seem a little off while you are attending college. Luckily, there’s still plenty to do such as visit the many trendy restaurants in Virginia Highlands while Fernbank Forest is a short drive to 65 acres of nature. Student that are apartment searching in the area will be happy to know that there are plenty of apartments with utilities included for those looking to cut costs. Decatur is comprised of several main neighborhoods in its four square miles, and although they are all similar in most ways, they differ in a couple. Winona Park is within walking distance from downtown while Agnes Scott University and its beautiful campus is right in the neighborhood. Oakhurst in not much further from downtown, but has its own collection of retailers and shops as well as a central park for its community making it extra pet-friendly. Both neighborhoods have houses for rent and luxury apartments interspaced throughout their communities, perfect for those that would like to rent before buying a home. Just make sure to use a reliable apartment finder as opposed to craigslist for the best results. Great park for children and families. Love the rennovations! RentLingo is your trusted apartment finder in Decatur. We hire local experts, such as former property managers and locators to anonymously tour and consistently rate and review every available place. They share their honest and unbiased perspective with you, so you know how every rental ranks in the area. Because our experts tour every property, we can offer consistent apartment ratings across every region. So unlike finding a Backpage or Craigslist rental, you can trust these apartments are verified and trustworthy: whether it's a cheap studio or a one bedroom with all utilities paid all the way up to a nice house for rent or a luxury condo.